We’ve been writing for some time that one of the consequences of the protracted super-low interest rate regime of the post crisis era was to create a world of hurt for savers, particularly long-term savers like pension funds, life insurers and retirees. Even though the widespread underfunding at public pension plans is in many cases due to government officials choosing to underfund them (New Jersey in the early 1990s is the poster child), in many cases, the bigger perp is the losses they took during the crisis, followed by QE lowering long-term interest rates so much that it deprived investor of low-risk income-producing investments. 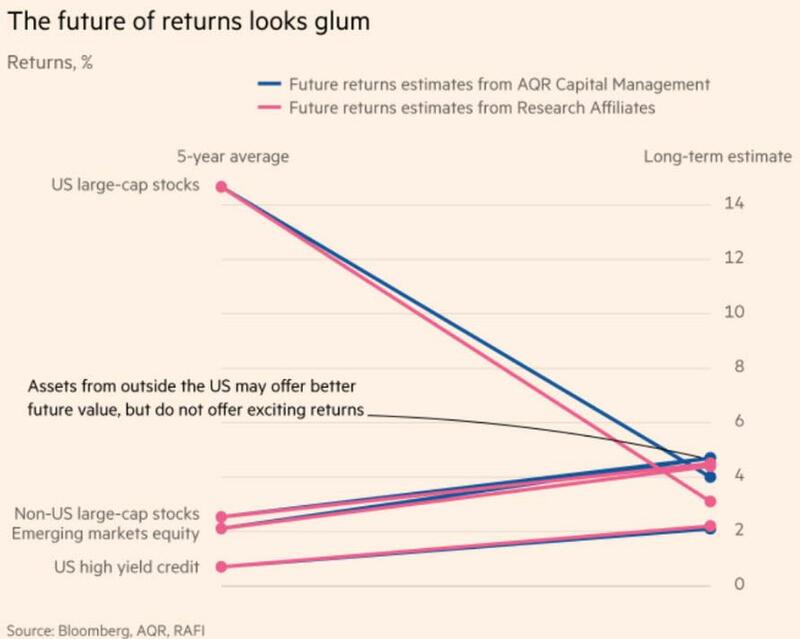 Pension funds and other long-term investors had only poor choices after the crisis: take a lot of risk and not be adequately rewarded for it (as we have shown to be the case with private equity). And as we’ve also pointed out, if you think public pension plans are having a rough time, imagine what it is like for ordinary people (actually, most of you don’t have to imagine). It is very hard to put money aside, given rising medical and housing costs. Unemployment means dipping into savings. And that’s before you get to emergencies: medical, a child who gets in legal trouble, a car becoming a lemon prematurely. And even if you are able to be a disciplined saver, you also need to stick to an asset allocation formula. For those who deeply distrust stocks, it’s hard to put 60% in an equity index fund (one wealthy person I know pays a financial planner 50 basis points a year just to put his money into Vanguard funds because he can’t stand to pull the trigger). 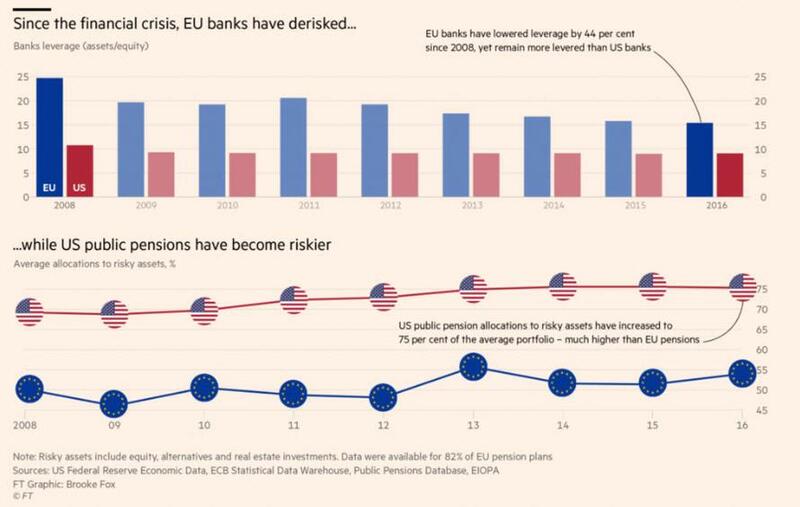 Pension funds have taken on many of the risks that were once held by banks. Low bond yields, which make it more expensive to guarantee an income, have forced them to take extra risks. They now hold assets, such as hedge fund and private equity investments, with much concealed leverage. And many companies have transferred the risk of bad investment performance from their shareholders to savers – and savers are not usually well-equipped to deal with them. The result: the risk of a sudden banking collapse, which almost happened 10 years ago, has reduced. But the risk of social crisis, as people enter retirement without enough money, is rising. All the central bank activity spurred widely varying returns on assets around the world. US stock markets enjoyed arguably their longest bull market on record. Real assets, such as real estate (which benefits from low interest rates), have also fared well. But markets outside the US fared far worse, burdened by worries about China, and by the sovereign debt crisis in Europe, which was followed by a severe economic slowdown. While the S&P 500 gained 175 per cent after Lehman fell, stocks in the rest of the world gained only 55 per cent, equivalent to a nominal annual return of barely 4 per cent. Recall that we’ve pointed out how CalPERS’ returns have lagged those of other large public pension funds, and in particular, those of CalSTRS. One of the big reasons is that its peers have a much lower allocation to foreign stocks. I would assume their aim is to be in more asset classes to reduce risk, while as CalPERS’ consultant Wilshire recounted yesterday, CalPERS objective is to participate in global growth. That hasn’t been working out all that well. The key insight is this: the biggest factor determining a return on your asset in the future is the price you pay for it now. If it is expensive when you buy it, your likely return is lower than if you buy it cheap. Abandoning DB [defined benefit] plans reduces the risk that companies will face bills that they cannot pay. 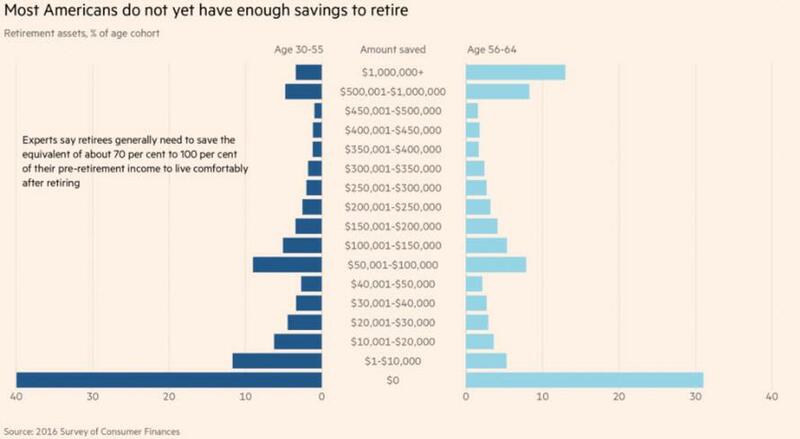 But it opens the greater risk that individual savers, far less sophisticated than the actuaries who run company pension plans, will fail to save enough for retirement – particularly as many suffer stagnating wages and have difficulty meeting their current commitments. The evidence from the US is alarming…. Most Americans with DC [defined contribution] plans do not have anything like enough money saved to support them in retirement…. If you want a decent chance of an income of two-thirds of your final salary for the rest of your life, you will need a retirement fund worth more than 10 times that final salary. Only a tiny proportion of Americans are on course for achieving this. The article drily notes that countries that are introducing defined contribution plans should not expect them to fare better than they have in the US. I wonder how Australia’s superannuation scheme, which had just been put in place when I was there, is doing. It initially required workers to put 9% of their pay in a superannuation fund, and I believe is now 9.5% Employees get tax breaks if they make additional voluntary contributions. “Super” gave me the willies because it looked like there were way too many paid advisors and fund fees in the system. This picture makes clear why so many Americans are interested in moving to lower-cost countries when they retire, particularly given the horrible costs of American healthcare. And don’t think Medicare is a magic bullet. A friend was hit with a $25,000 bill for her stay in a rehab facility after a bad leg break. But the flip side is a quite a few people uproot themselves, only to wind up coming back to the US because they find themselves unable to adapt to a new country. So there are no easy answers, individually and collectively.